From poisonous chocolate and Christmas tree water, to hazardous open flames and pine needles, holiday celebrations can present a number of hidden dangers to pets. Chocolate is toxic for dogs – so keep an eye on edible presents! The festive season is often full of treats that humans definitely enjoy, but it isn’t a good idea to share all of them with pets. Chocolate is toxic to dogs, so keep boxes and bags – both open and closed! – off the floor and out of their reach. Some confectionary contains extra hidden dangers like nuts, which can be a choking hazard, and raisins, which are very toxic. Dogs are also sensitive to the lactose contained in milk, which can also be hidden in chocolates and other candies. To avoid an emergency trip to the vet, keep your candy away from canine noses. Christmas lunch or dinner is one of the highlights of the holiday season, and though it’s hard to resist letting our dogs join in, they should stick to their own food. 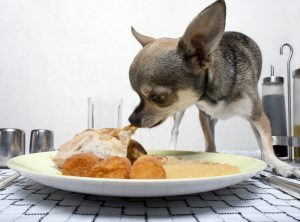 Human food contains things we often forget are bad for our pets. Like chocolate and grapes, onions can cause irritation in the intestinal tract, as can their cousins, chives and garlic. Desserts that contain chocolate, nuts, grapes or raisins are also dangerous, no matter how badly your dog might seem to want them. If your festive meal includes corn on the cob, keep it well away from your dog. Corn is actually hard to digest, so it holds little nutritional value and the cob can get stuck in the gastrointestinal tract, causing serious health risks. If you’re worried your pet has snuck a bite or ten out of any of these forbidden treats, keep a close eye on them and take them to your veterinarian if you’re worried. Make sure your dog has a full bowl of fresh water to avoid the temptation to start sampling human drinks. Fruit juice is too sugary for dogs, which can cause weight gain. Milk can cause upset stomachs and vomiting. Alcohol affects dogs much the same way it does humans, inducing vomiting, dizziness and decreased coordination – but they’re often much smaller, so it affects them much more severely. Caffeinated drinks pose a similar risk, causing hyperactivity, restlessness and even seizures if the dose is high enough. Keep your drinks and the drinks of your guests off the floor and away from the edges of tables where they might get caught by excited tails to keep your dog drinking consistently from his own bowl. Think twice about giving your dog a bone! Cooked bones, such as those from a festive joint, are prone to splintering into shards that could seriously damage a dog’s mouth, throat, stomach or intestines. And the same hazard is found in small bones from poultry. Any swallowed bone runs the risk of getting lodged in a dog’s digestive tract. Raw bones generally don’t splinter, so the risk of harm to the mouth and throat from sharp fragments is reduced, but chunks of undigested bones could still build up in the guts, causing serious harm to your pet. If you choose to give your dog a bone, keep a close eye on him – vets recommend that the bone is approximately the same size as your dog’s head. Tree ornaments, from baubles to candy canes, can look exactly like a toy just waiting to be played with to a dog. But glass ornaments run the risk of shattering if knocked from a tree or shelf, posing a threat to your pet’s paws. Similarly, plastic ornaments can be chewed into sharp pieces, and if ingested can cause damage to the intestinal tract and require immediate attention from a vet. Edible tree decorations wrapped in plastic pose the same threat, with the added lure of a tasty smell. Move these high-risk decorations to the top of the tree and out of harm’s way. String lights often have electrical wires wrapped in thin, easily-chewed plastic coating which can prove irresistible to nibbling teeth – at the risk of electrocution. Keep wires covered and taped down to keep them out of curious mouths – busy them instead with toys of their own. … And neither is wrapping paper! There will probably be plenty of wrapping paper all over the place once the presents have been exchanged, but keep an eye on your dog. 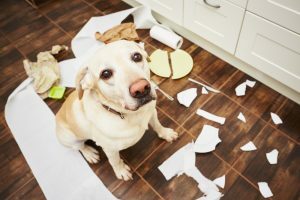 Paper is easily torn and accidentally eaten, and since it isn’t digestible it could get stuck in your pet’s intestinal tract. The same applies to ribbons, plastic tape, string and bows – keep them off the floor and store them all together away from your dog until they can be disposed of properly. Instead, distract them with their own toys to keep them away from this potential hazard. There’s nothing prettier than a fresh Christmas tree, but the endless dropped pine needle clean-up can be tough. Don’t let your dog help out by eating them – the needles can get stuck in their gums, causing them significant distress, upset their stomachs or lodge in their guts, requiring a vet’s intervention to remove. Thorough, regular vacuuming is the only sure way to avoid these risks, short of investing in an artificial tree. If your tree stands in water, make sure its covered to avoid pets drinking from it as Christmas tree water can contain chemicals leeched from the tree that are dangers for animals (and humans!) to drink. Ensure your dog has a bowl of fresh water at all times to remove this temptation. Common festive plants such as mistletoe, poinsettia and holly are also bad for dogs to eat, and will cause vomiting and diarrhea. Keep them in locations your dogs can’t reach to avoid this. Burning candles are a risk to pets and people alike. If you must have lit candles, ensure your pets are kept well away from them – it only takes one wagging tail to knock a candle onto a carpet and risk a house fire. Unlit, scented candles are also a temptation to smell-oriented dogs, and will cause sickness if eaten. Lit or not, keep candles away from your pets on high tables or shelves. If your home boasts a fireplace, use a screen to avoid noses and tails from getting singed. Make sure your dog is supervised at all times around open sources of fire. If your pet has any allergies or intolerances, check the labels on edible presents before feeding them to your dog. Some treats are healthier than others, so look for natural ingredients with few preservatives – and favor those over ones that pose a choking hazard, or rawhide. Check toys for loose or removable parts that could be chewed off and swallowed, and for poorly sealed seams that could hide moldy food and bacteria. The material must be tough enough to withstand the most enthusiastic chewing. Make sure the toy is not too small – little toys risk being swallowed, which can seriously harm your dog. Check your dog’s present pile to avoid disappointment – or worse, trips to the vet. Holiday gatherings can be stressful for all kinds of pets, and even the friendliest of dogs can get worn out with all the comings and goings of guests throughout the day. 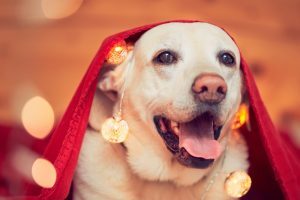 New people, loud noises and bright lights can overwhelm animals, so giving them a safe space away from the festivities can help them relax and enjoy the day as much as their human companions. PetBucket is an online retailer, stocking pet vitamins and supplements, as well as flea and tick treatment for dogs, such as Nexgard for dogs, Seresto and Bravecto chews, plus flea and tick treatment for cats, including Revolution for cats.